Multi-platinum and Grammy-winning artist Justin Bieber can add eight more honors to his long list of awards. This time, they're coming from Guinness. 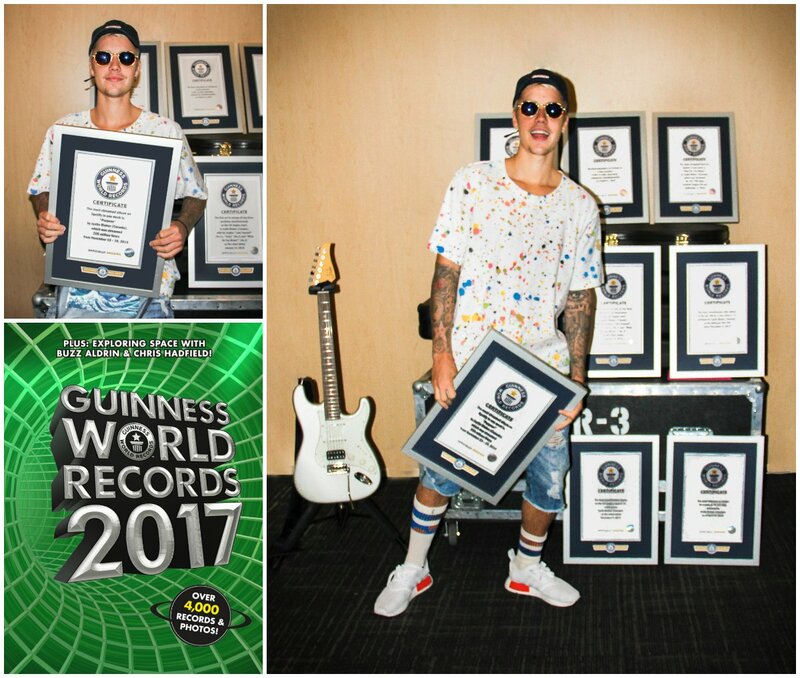 The 2017 edition of Guinness World Records lists Bieber as the record holder in eight different categories — and no, "number of fans he's made cry" isn't among them. Bieber has blown all other musicians out of the water for "most-streamed track on Spotify in a single week": His single "What Do You Mean?" racked up an astonishing 31 million plays in just seven days. His most recent album, Purpose, is the most-streamed album in a single week on Spotify, clocking in at 205 million streams. Shortly after he released Purpose, Bieber also set the record for having the most simultaneous tracks on the Billboard Hot 100 — he landed 17 songs on the chart last December. He's also the first-ever artist to hold the top three slots on the U.K. singles chart at the same time, with "Love Yourself," "Sorry," and "What Do You Mean?" And that's only half the records he just secured. Bieber also now holds the world record for having the most Twitter followers and YouTube subscribers of any male human. His YouTube channel is the most viewed YouTube channel of any musician ever. And finally, he had the most simultaneous new entries onto the Billboard Hot 100 chart, with 13 songs crashing the party at the same damn time. In short, Bieber is an unstoppable force of music, and Guinness World Records decrees that we all bow down.